Harvest Your Data has all the export options you need for downloading your data collection results in the SPSS format or in CSV (comma separated value) format, which is 100% compatible with Microsoft Excel. The SPSS format is compatible with the IBM SPSS Statistics software package, the industry leading platform for statistical analysis in the fields of social science, health science, marketing, and more. Harvest Your Data ensures that your results come ready to use with a minimum of fuss – we know the importance of streamlining your data analysis. 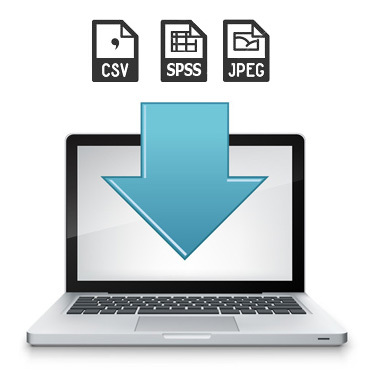 Surveys and forms that capture digital media – including photographs and signatures – can be easily downloaded with all the CSV results and media in a single zip archive. No more time consuming matching up of your digital media and survey data – Harvest Your Data keeps everything together in one handy package. Advanced users can assign a score to an answer and download the scores with the CSV data. Organize your respondents by importance and make sure you know which surveys are really worth your attention. Harvest Your Data features a powerful API for your technical team. Automate the downloading of results with the Developer API and integrate your data with other software. Harvest Your Data’s seamless integration makes exporting and importing results quick, easy, and efficient. Using the API for results automation can save you hundreds of hours, boosting your productivity.